Plenty of fish have been caught on hendricksons on the top the past two weeks from noon through the afternoon. Sulphurs will catch fish in the upper river around masemore to the dam. Caddis size 16’s have been effective during the day between masemore and big falls, emergers are working great in the riffles, swinging wet flies such as hares ear wets or partridge and orange soft hackles. The fish are really active and with ideal water temperatures the fishing is about as good as one could want for the time of year. This entry was posted in fishing report on April 28, 2017 by Theaux Le Gardeur. Please join us for a fly fishing school. On Sunday May 28th a Backwater Angler Guide will be teaching a fly fishing school that is ideal for beginners. If you’re planning on fly fishing in Maryland, or anywhere else for that matter, this course is a great introduction to the sport. The school covers knots, casting, gear and fly selection. Class is held from 10:00 AM to 1:00 PM. Cost is $125 per person and includes the use of gear. A Maryland non-tidal fishing license and trout stamp is required and may be purchased at the shop with check or cash the day of the school. Class size is limited to 4 and pre-registration is required. Please give us a call at 410-357-9557 to pre-register. This entry was posted in news on April 22, 2017 by Theaux Le Gardeur. Please join us for a fly fishing school. On Saturday May 27th a Backwater Angler Guide will be teaching a fly fishing school that is ideal for beginners. If you’re planning on fly fishing in Maryland, or anywhere else for that matter, this course is a great introduction to the sport. The school covers knots, casting, gear and fly selection. Class is held from 10:00 AM to 1:00 PM. Cost is $125 per person and includes the use of gear. A Maryland non-tidal fishing license and trout stamp is required and may be purchased at the shop with check or cash the day of the school. Class size is limited to 4 and pre-registration is required. Please give us a call at 410-357-9557 to pre-register. Please join us for a fly fishing school. On Sunday May 14th a Backwater Angler Guide will be teaching a fly fishing school that is ideal for beginners. If you’re planning on fly fishing in Maryland, or anywhere else for that matter, this course is a great introduction to the sport. The school covers knots, casting, gear and fly selection. Class is held from 10:00 AM to 1:00 PM. Cost is $125 per person and includes the use of gear. A Maryland non-tidal fishing license and trout stamp is required and may be purchased at the shop with check or cash the day of the school. Class size is limited to 4 and pre-registration is required. Please give us a call at 410-357-9557 to pre-register. Please join us for a fly fishing school. On Sunday May 7th a Backwater Angler Guide will be teaching a fly fishing school that is ideal for beginners. If you’re planning on fly fishing in Maryland, or anywhere else for that matter, this course is a great introduction to the sport. The school covers knots, casting, gear and fly selection. Class is held from 10:00 AM to 1:00 PM. Cost is $125 per person and includes the use of gear. A Maryland non-tidal fishing license and trout stamp is required and may be purchased at the shop with check or cash the day of the school. Class size is limited to 4 and pre-registration is required. Please give us a call at 410-357-9557 to pre-register. This entry was posted in events on April 22, 2017 by Theaux Le Gardeur. 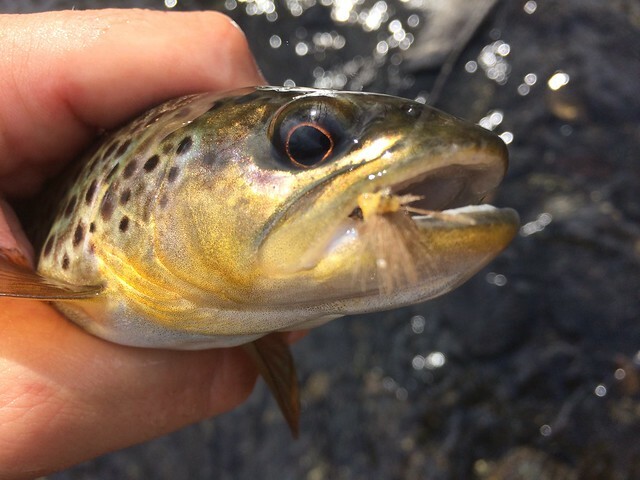 The Gunpowder River is clear, low at 30 Cfs and 58 degrees.Thanks to Gene for the great stream report and great shot of a wild brown with a Sulfur Comparadun. March Brown and Hendricksons have been coming off the past few days from Masemore through to Big Falls. Trout have been looking to the surface in the afternoon through the evening. Pheasant tail nymphs are still the ticket in the faster water along with soft hackles and hares ear wets. Sulphurs are still to be found from Masemore up to the dam and you can use emergers and CDC duns to match the hatch. Mike Bachkosky’s snowshoe rabbit emergers, unusuals and red quill parachutes have been working fantastically. Please note: We will be closed Easter Sunday-find an egg or find a wild fish! This entry was posted in fishing report on April 14, 2017 by Theaux Le Gardeur. Please join us for a fly fishing school. On Sunday April 30th a Backwater Angler Guide will be teaching a fly fishing school that is ideal for beginners. If you’re planning on fly fishing in Maryland, or anywhere else for that matter, this course is a great introduction to the sport. The school covers knots, casting, gear and fly selection. Class is held from 9:00 AM to 1:00 PM. Cost is $125 per person and includes the use of gear. A Maryland non-tidal fishing license and trout stamp is required and may be purchased at the shop with check or cash the day of the school. Class size is limited to 4 and pre-registration is required. Please give us a call at 410-357-9557 to pre-register. This entry was posted in events on April 14, 2017 by Theaux Le Gardeur. 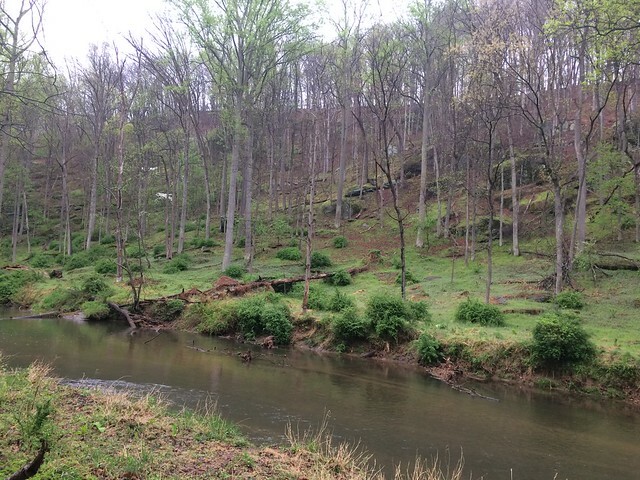 The Gunpowder River is clear flowing at 37 CFs and is 48 degrees F. Thanks to Gene for the stream report! Heavy rain yesterday saw Little Falls rise to 2500 cfs. Downstream from where it joins the main stem of the Gunpowder saw levels of almost 3000 cfs – 2 feet above the flood level. Whilst the upper Gunpowder was stained yesterday and high with surface runoff from roads, levels quickly fell back to normal overnight and its back to 38cfs and clear by today. For the weekend nice temperatures and sunshine should bring out more Sulphurs and Hendricksons in the catch and release sections of the river. 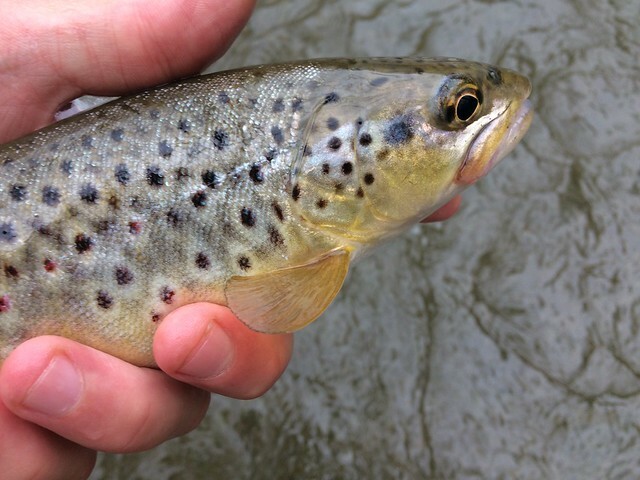 Look to fish the faster water with pheasent tail nymphs and emergers size 12-14 and you’ll encounter feeding trout. This entry was posted in fishing report on April 7, 2017 by Theaux Le Gardeur.